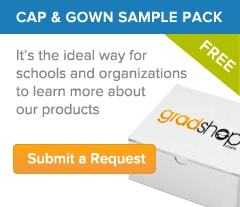 Why buy your graduation products from Gradshop? No matter what style of graduation ceremony or commencement, Gradshop has the products you need. 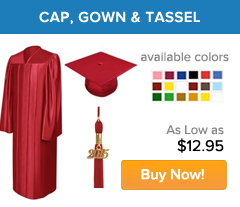 Gradshop offers the largest online selection of graduation caps and gowns, graduation stoles, graduation gifts and graduation accessories for your preschool, kindergarten, elementary, middle school, and high school graduation. We also carry specialized college and university gowns, robes and other products for bachelors, masters and doctorate graduations. You'll find the guaranteed cheapest prices on everything from graduation gowns, graduation caps and graduation tassels to diploma covers, honor cords and graduation academic hoods. Offering secure and safe ordering, options for free shipping and flexible options, Gradshop is the web\'s number one graduation cap and gown outfitter. We proudly accept Secure Shopping Guaranteed!